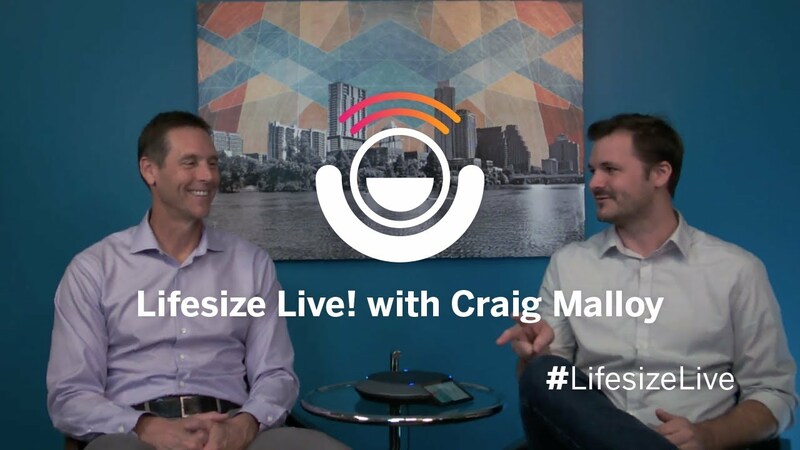 Hello, everybody, and welcome back to Lifesize Live!, the live web show produced entirely through the Lifesize platform. I'm your host, Julian Fields, and with me, back by popular demand, we’ve got Craig Malloy, going in for round two. Sometimes they don't have great work-life balance, and that's a problem also. Well, you get the hardest work-life balance and then you can distill good information from it. So, where do you place work-life balance? I think it's incredibly important. For me, and I think a lot of CEOs, you're thinking about the business all the time. If I'm awake and I'm not playing with my kids or doing something with my family, I'm thinking about the business. I'm taking a shower, I'm thinking about the business. I'm riding my bike, I'm thinking about the business. I'm going swimming, I'm thinking about the business. It’s not just being present, but it's about unplugging your brain to force yourself to not think about the business and be present for your family. That's probably the most important thing — not only physical presence but mental presence — and it's a hard thing to do. I'm not perfect at it, but with 35 years of experience, I think I'm finding what works for me and what works for my family. Okay, well, I think that brings us to a topic of interest for work-life balance: vacationing. What are some things that you do in a vacation setting that let you balance the two? Well, I think everybody has to find their own way that works for them. For me, I'm an early riser, so I usually get up early, make coffee, and if we're in someplace nice, I’ll sit outside and check my email for maybe half an hour and get a little work done. I’ll do the things that have been on my mind, and then by the time my family wakes up, I'm done. I'm kind of done for the day unless something urgent comes up or when somebody calls or texts me, but I generally won't check my email again until the next day. That way, I’ve checked in so I don't feel like I'm so far behind when I get back or that I'm missing something important, and I feel kind of at peace with the day so I can go off and enjoy my vacation day. I do that virtually every day — check in for half an hour or so. I try not to schedule meetings on vacation unless it's something super important like a fund-raising call or an investor or some urgent customer issue. But I do try and check in for a little bit and then unplug for the rest of the day. And again, that way you're up to speed, and when you're kite surfing and you're thinking, you're able to kind of get a little bit of drip into ideas and things like that. Actually surfing surfing, not kite surfing. Gotcha. Was it a good time? Yeah, it was great. It was good. Well, how about the flip side of vacationing? You've got work travel, and obviously that's a big one. It seems like the more senior you get, the more travel you seem to inherit. Well, for me, my company is a video communication company so I can get a lot of this done with video conferencing, which is great, but sometimes you do need to show up. With work traveling, I'm kind of on all the time. If I'm sitting in an airport or a hotel or even on an airplane (which now have Wi-Fi), I can get a lot of stuff done so I actually find myself being fairly connected all the time. I always try to check in with my wife and my kids every day or multiple times a day just with a text or a video call or something at night. Work travel means you're on all the time. Another point with work-life balance is just how you incorporate it with your daily routine. Do you keep your phone by your bed, and do you check your email the first thing when you wake up? I purposely keep my phone in the kitchen. Sounds like a good tip. It never goes into my room, never is upstairs. I don't look at my email until I get to work in the morning. When I’m at home in the mornings, I just want to wake up, see my kids, read the news, and have breakfast. I don't want to be constantly bombarded with work — having personal time in the morning gives you free space in your brain. Particularly, I like to read the news, like the economic news, the financial news, world news, and various different sources when I'm eating breakfast because normally, in the summer my kids are still asleep and during the school year they're off to school. So the key takeaway is to work while the kids are asleep. Yes. Work while the kids are asleep and you'll never get in trouble. I actually know guys whose wies vlock their phones in the hotel room safe so they can't get on them — they have that little self-control. So I try to stay away from my phone when I’m at home, and then during the week, we always have family dinner together so I try and get home around 6 pm, 6:30 at the latest. And that's why I don't live that far away. There's a reason why the office is in this location. Tip number two, live closer to the office. I've worked jobs where I had an hour-and-a-half commute both ways, and that is miserable. You're giving up three hours of your day — it's terrible, it's not worth it. So in the morning I have a seven-minute commute and in the afternoon a 12-minute commute. One thing that we talk about with video conferencing is offsetting that commute so I can work from home at the first hour of the day and not have any traffic at all. If you send me an email, I'm going to respond. Yeah, then all of sudden, the entire company's working at nine o'clock at night and that's not good for anybody. So you set the expectations that way. I do. Because I think, not only is it healthy for me, I think that sets the tone for the entire company. Now, there are times when we have stuff going on, one of our servers goes down, we have some customer issue, and you have to do what you have to do at that point. But in the normal course of business, I try and log off when I get home. I have two sets of kids: I have three older kids who are 24, 27, 29, and then I have two younger ones who are 12 and 10. And I'm not saying I wasn’t doing the best I could, but I think I probably wasn't as present as I could have been with the older kids. I was younger in my career and working so hard, and I didn’t realize how your kids grow up really fast. With the younger two, I find myself conscious of being much more present. Because kids grow up so fast, I want to be here; I don't want to miss it. It's important for them that I'm there and present and being a good dad, and it's important for me to not miss that experience. I think I'm more in tune to the work-life balance now in the last 10 years than I probably was in the previous 20. Interesting. Well, I know we're getting close to time, and I wanted to give you one last moment for any parting words of wisdom for the budding entrepreneur when it comes to work-life balance. Yeah, I think just two things: happy wife, happy life. I think people have heard that before, and it's actually true. And your kids grow up faster than you think, so be present. I've got a one month old. Already pushing up. So yeah, absolutely. It'll be like that and they're off to college. Be present. Well, Craig, thank you so much for coming back and joining us for round two. I'll have to get you back in the books for another topic. If anybody out there has any questions, be sure to shoot those over to us @lifesizeHD on Twitter, Instagram, Facebook, all the social medias, and we're happy to get back in touch with you. Anyway, thanks everybody for joining us. We'll see you next time.